The new director gathered his staff of direct reports. Four people. All of them with over 2 years tenure and extensive experience in their respective roles. He hadn’t been hired to perform a turnaround, but instead had been tapped for his vast experience as a solid technology expert. The CTO had heard terrific things about Don. The interview process went well. All signs appeared to prove that Don would be a great director. But the signs didn’t reveal Don’s view of humanity. In their first staff meeting Don held forth with blunt, almost offensive directives, treating these four people as though they lacked basic intelligence. Shell shocked, the team sat in silence, answering only when directly spoken to and did their best to simply get a lay of the land with their new boss. They’d heard he was very bright, but they had no idea he thought himself so much smarter than everybody. And anybody. Immediately he began listing things that were important to him. And imposing a variety of rules that instantly put a choke hold on decision making. He wanted everything – and I mean EVERYTHING – coming through him. It was clearly a new day and the four direct reports left the meeting in stunned silence. Fearful of being seen huddling they secretly conspired to meet after work. A very smart guy with newly appointed power, Don was making a strong impression. A bad one. Within 8 months Don’s exit seemed 8 months too late. Half of his direct reports had accepted new positions elsewhere. Only one had been replaced as Don struggled to get the team back to full strength. One idiotic move after another. A litany of stupid rules and procedures had turned a once stellar team of four into a lack luster team of 2 very demoralized people who hoped they could outlast Don. The toll was extensive. And costly. Resulting in lost productivity, numerous resignations of good people and greater pressure on the CTO to “get it right” next time (that’s how the CEO expressed it). 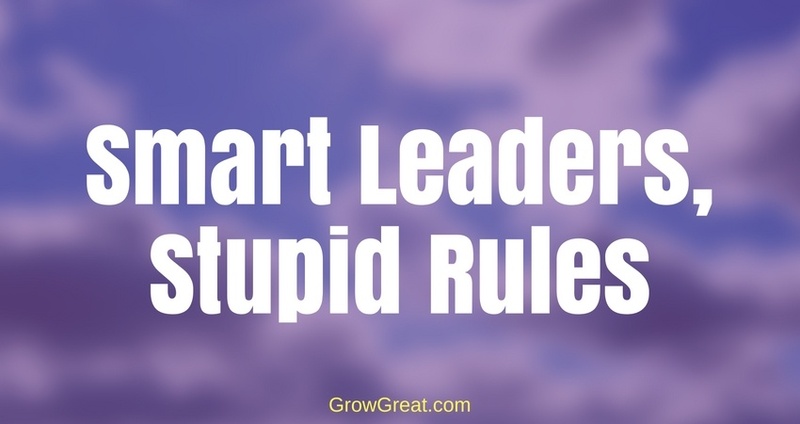 How can smart bosses (and leaders) impose and even love stupid rules? Well, let’s be clear. Smart leaders are often smart mostly in their own estimation. But sometimes they might outsmart themselves. Or they may have their ears and mind stopped up to listen to anybody else, always thinking they know best. It could be they’re sometimes insecure, feeling as though they have to prove they’re worthy of their position. Somebody way smarter than me will have to figure all that out. But I do know this much after decades of running successful companies – even smart people can do stupid things, including imposing stupid rules or implementing stupid procedures. Let me give you just 2. The two biggest ones I continue to see. This is often the case when the rank and file find procedures or workflow frustrating. Daily they’re involved in doing the work. But sadly top brass won’t involve them in finding better solutions. Stupid rules and decisions happen whenever the leaders are further away from the actual work impacted by the rules or decisions. Such an easy thing to fix. But it requires a humility that sometimes evades leaders. Sometimes it’s fear and not knowing how to effectively engage with the work, and those who perform the work. Relating to people is necessary and not all leaders (or title wearers) have the ability. Most often, in my experience, it stems from the belief “I know better than you.” That arrogance can cause smart people to make stupid decisions. Get out of your own way if you’re that kind of a leader. Realize that if you were doing the work – the actual work – 8 or more hours a day, you may have some insights that others would lack. Sure, there could be other factors that would escape you, but engaging the people who do the work can also provide you the ability to listen, and to share. Everybody can learn. Everybody can better understand the problem and devise an effective solution. There’s a lot of brain power on that front line. It doesn’t matter if you’re running a business in retail, medical, manufacturing, hospitality or any other sector. Every smart leader will work hard to close the distance gap between the actual work and the decisions that affect that work. We have a specific problem. So we address it. We think we fix it. Inadvertently we’ve created problems we didn’t have before. We’re either too blind to see those new problems, or we minimize those problems as we focus on how well we did addressing the first problem. A company had no onboarding procedure. Like many companies they simply had a new employee report to a new post and left it up to each boss to welcome that employee and deliver whatever training might be necessary. Sure, there were the required HR type things. The company manual was handed out, requiring a signature that the new employee had received it and would comply with the contents. But the company had no structured process and it was creating quick turnover of new hires. The braintrust decided that the central office of the region (within an hour or so of all the locations) would be a great place to conduct a few days of onboarding before employees reported to their designated offices. They spent weeks designing a training program, complete with slide decks and scripts for live training. Given the size of the operation they figured they’d perform this onboarding every month at a predetermined time. The schedule was established and the first sessions went off without much of hitch. Great! Problem solved. The company had mandated that before any new hire could report to the office which hired them, they had to complete the 3-day onboarding at regional headquarters. Okay, that seems reasonable. Until you realize that offices were now held hostage on when they could actually start their new hires. If the 3-day onboarding for the month had just completed, then it meant the new hire would have to wait a full month before starting. People would accept the job offer, then bail out when they found a job that would allow them to start immediately. New hires weren’t able to go a full month without a paycheck waiting on the onboarding schedule. Sometimes they’d notify the company they were taking another job. Quite often they simply wouldn’t show up for the onboarding. The result was an enormous problem in understaffing at area offices. The offices were constantly feeling the pressure to not only find qualified candidates to hire, but trying to line up those candidates to fit the onboarding schedule. Their work load didn’t matter. Smart people had implemented a dumb process that created new – even bigger – problems. Unintended consequences were more devastating than the original problems of not having an onboarding process. You’d think such problems would be quickly addressed. You might be wrong. Sometimes leaders are so dug in on a decision they refuse to admit their fix has caused new problems. That was the case with this onboarding problem. Dozens of potential good hires got lost in the shuffle. Countless man hours of frustration ensued at offices that were woefully understaffed. All because leaders didn’t open their eyes to the problems they had created. Did they not care? Were they indifferent to staffing challenges? Who knows? Who cares? The fact was, one problem was addressed, but the solution created a new, bigger problem that impacted the business. Let me leave you with one powerful suggestion. Learn to recognize the power of people – namely, your people. The people in your organization. The people doing the actual work. The collective group is far smarter than you by yourself. They always will be. It doesn’t matter how talented you are, how high your IQ, or how advanced your degrees. You and a room full of people doing the work is infinitely smarter than just you. Smart leaders – the very smartest ones – are people who know the value of collaboration and connection. They intentionally engage others with a strong desire to learn and understand. When they get it wrong – and we all do – they readily accept it, and correct it. It’s not about saving face or looking good. It’s about being the best. It’s about making a positive difference. Serving the good of the organization by serving the people doing the work…that’s the goal. It’s always the goal.